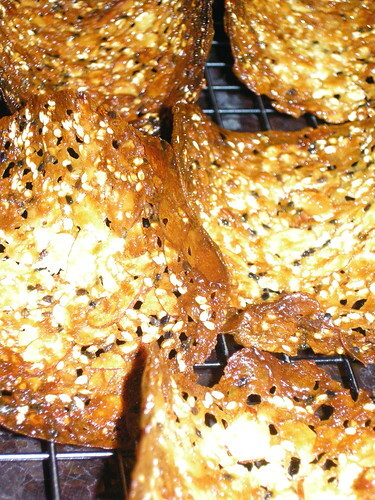 Named for their resemblance to roof tiles, tuiles are light, lacy cookies with lots of crunch. 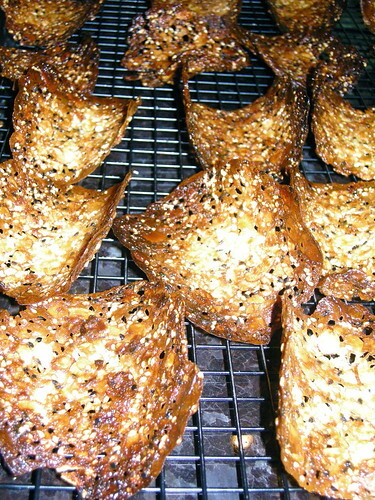 I generally really like tuiles, but I did not particularly care for these. I think they were not my absolute favorite cookies because of the sesame seeds; I only really care for the flavor of sesame in hummus, but its flavor is mostly masked by that of the lemon and chickpeas. Fortunately, my dad works in an office full of men who will eat just about anything. It is a good outlet for many of my baked goods, and I think the guys appreciate a homemade dessert, no matter what it is. I am glad to oblige, as I would probably weigh three hundred pounds if left to consume everything on my own. Though these may not be my most favorite cookies, I don't doubt that others will enjoy them. I sincerely hope that everyone at ICAP who tastes these delicate loves them, or at least likes them enough to eat a whole cookie. Whatever their taste may be, I can attest to their beautiful laciness. Mix together butter, sesame oil, clementine juice and zest, and sugar. 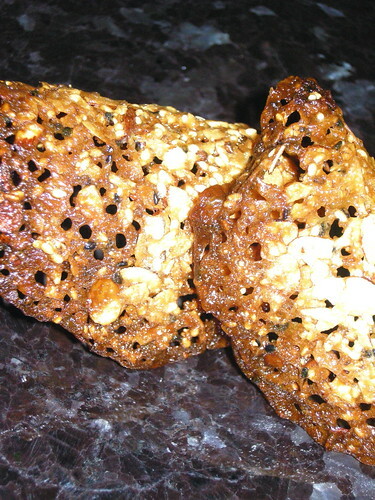 Stir in flour, almonds, and white and black sesame seeds. Let batter rest for 1 hour at room temperature. Preheat oven to 375 degrees. Line baking sheet with parchment. Drop batter by the tablespoon onto prepared baking sheet. Bake for 8-9 minutes, rotating halfway through. Once just browned, remove them from the oven and drape over a rolling pin until they set. Repeat with remaining batter.